Zie hieronder de update van Dhurba. Ze zijn nog steeds keihard aan het werk, zoals jullie op de bijgaande foto’s kunnen zien. En wat goed dat de lokale bevolking, in dit geval van het dorpje Nandar in de streek Siddhi, erbij wordt betrokken. Het wordt dan echt ‘hun’ school! Sapana village social impact (SVSI) and Sapana lodge team went off on June 21st to Bandar primary school in Siddi chepang village ...with a mission to rebuild the school buildings(destroyed by the earthquake) as they took the materials like tin sheets for roofing, iron nails, foods for laborers and local children, and high quality water pipes for drinking water and lots of other construction materials with the help of SVSI as the government could not help financially but gave orientation to people for the participation and unity. They reached the top of the hill on Sunday evening the same day. The next day in the Monday morning, the work was started. The local participation was very good. The required wood was provided by the community forest. The ground was cleaned first and wooden pillars were installed. On Tuesday, roofing works were completed as well as the walls were built out of the wooden flakes provided by the local community. Similarly, on Wednesday morning, the works done were like - partitions made for the classrooms, management of benches in the classrooms, safe installations of drinking water pipeline from a far distance to prevent the water shortage in the locality and so on. The team returned back late in the Wednesday evening after completing the mission. I just wanted to share this with all. Zie onderstaande mail van Dhruba uit Nepal. Een deel van onze opbrengst blijft beschikbaar voor noodhulp, een ander deel later voor het opbouwen van de schooltjes in Siddhi. Over de vreselijke gevolgen van aardverschuivingen ook ten gevolge van de aardbevingen en de harde regen op dit moment horen wij in Nederland niet zo veel. Toch zijn er ook nog veel slachtoffers in nood ten gevolge hiervan. Toen ik op google ging zoeken, vond ik inderdaad berichten over het gebied dat Dhurba omschrijft. Er kunnen daar geen helicopters naar toe. Dus is de locale bevolking opgeroepen te helpen in samenwerking met de politie. Er zullen vandaag dekens en kleding gebracht worden naar deze gezinnen. Geld blijft hard nodig. De locale mensen in Nepal werken hard om dit geld goed te besteden! Dank weer namens hen! Ken je mensen die ook geld gestort hebben voor SVSI via Nepal Benefiet aalsmeer, en je denkt dat deze geen update mails ontvangen, misschien wil je dan hun emailadressen aan mij doormailen, dan voeg ik ze toe. 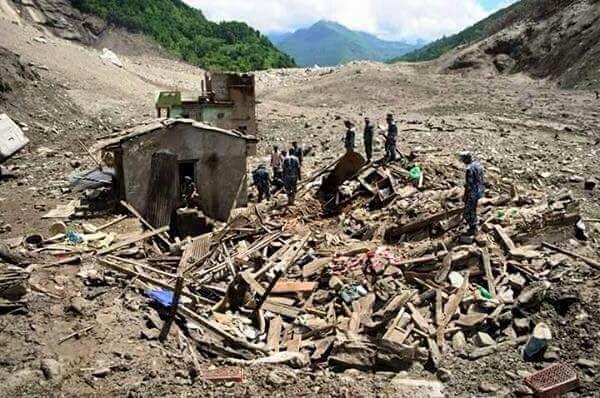 Recently there is a big landslide in Taplejung district (eastern part of Nepal) affecting many households. There is no place to return for 41 families. More than 150 people are taking shelter in a nearby school. They got no relief materials even they walked for more than 5 hours. According to the landslide displaced people, they have no place to go. In this context, it would be welfare if we could help them providing tents and clothes required as a basic need. SVSI is trying as much as possible to help them , survey plan is on process. I like to inform you that, the money you all collected to support the earthquake victims, can i use that money (2500 euros) to the victims of landslide in Taplejung? After the terrible earthquakes in Nepal that resulted the massive destruction, Sapana Village Social Impact engaged on Relief Distribution Programs in various parts of the country. With the worth support of many individuals, SVSI succeeded to reach most effected districts like Sindhupalchock, Kathmandu, Gorkha, Dhading, Rasuwa, Nuwakot and Chepang Hills of Chitwan. We truly thank everyone involved with our project works. In our second phase, SVSI sent a group of volunteers to servey the damages of schools in Siddi Village Development Committee. We were suggested by the District Education Office that the locals from Siddi demanded the re-construction of five school buildings. So our team collected the information right from the field visit and SVSI is starting the constrcution of those damaged schools very soon. Once again, we thank from our heart for all indiviuals who are directly or indirectly involved and have contributed for the project. Waar we het allemaal voor doen! Just sharing with all the respectable friends and family that our Sapana village team will be back today from tthe survey. They went for survey in 4 different villages of Siddhi(Chepang hill) by forming four groups to observe the condition of schools and today when they will be back we will have a meeting and we will immediately take action for rebuilding schools in Siddhi(Chepang hill). Just letting you know that we are continuously focusing in our work. Without all of your support we cannot do alone. WAT ZOU HET FIJN ZIJN ALS DE KINDEREN WEER ZO GOED MOGELIJK HUN NORMALE LEVENTJE ZOUDEN KUNNEN OPPAKKEN EN WEER NAAR SCHOOL KUNNEN! Tussen de ellende die er natuurlijk ook nog is, gebeuren er ook hele mooie dingen in Nepal, want er wordt door de Nepalezen die minder getroffen zijn, veel werk verzet om de getroffenen te helpen. Wij hebben inmiddels 3650 euro overgemaakt naar SVSI. Iedereen die al gedoneerd heeft HEEL VEEL DANK namens hen. Het geeft de harde werkers en helpers daar echt kracht en moed om hun werk voort te kunnen zetten. Soms met gevaar voor eigen leven, want de wegen zijn niet altijd veilig. Zie ook: www.facebook.com/nepalbenefietaalsmeer Als je wilt, like dan deze pagina dan. An earthquake measuring at 7.9 magnitute struck in Nepal on 25, 26 April and 12 May, causing widespread devastation. Sindhupalchock and Dolakha Districks are maximum effected areas by powerful hits. In order to bring relief supplies to the victims, Sujan Basnet - Program Director of SVSI and Santosh Bhatta - member of Sapana Village Lodge began their jouney to Kathmandu on 20th May 2015, driving on motorbike to survey. According to the information they ...collected consulting on the field visit, neither government nor any other social organization had reached to the worst effected village called 13 Kilo of Thumpakhar V.D.C. in Sindhupalchok where 141 families were in urgent need of food supplies and tents. Realizing the most necessity area, SVSI organized a truckload of relief materials like Rice, Beaten-rice, Lentil, Cooking Oil, Salt, Eggs and Tents to distribute to the victims. Before heading to Sindhupalchock, SVSI also distributed similar relief package to 61 journalists in Kathmandu who have massive loss by devastating natural disaster according to the jounalists of Chitwan Mr. Rajendra Acharya and Narayan Dahal who were involved in the team to deliver the relief. Board of Directors of SVSI Mr. Sajan Ram Bhandari and Mr. Ajit Man Pradhan attended the events to handover the relief to the victims. For the relief distribution program by Sapana village social impact(SVSI), yesterday a team of Sapana Village Lodge was busy with packing the relief items till midnight, that is heading today to the several villages in Nuwakot districts under Kalyanpur VDC - ward# 5 and 6 as well as Phikhuri VDC - ward# 7 for altogether 440 households in those villages. The relief items include the tents, various food items and so on. Today I am in office. Sujan and other staffs from hotel went for the relief distribution in SIDDI. Yesterday we worked together with 2 mother groups from 2 different villages. It was very nice to work together and not only that , a national singer called me and requested to get a chance for the participation in the relief distribution. He was with us yesterday and also went to siddi today as well. Yesterday, SAPANA VILLAGE SOCIAL IMPACT (SVSI) distributed a relief to the quake hit victims in several villages under SIDDI village development committee, ward #1,2,3,4 and 5 with more than 80% population of Chepang (Underprivileged group of people). It was provided to 300 people including Chepang, tamang, gurung and other groups in the villages where 70 houses were fully destroyed by the recent earthquake. SVSI distributed the tents and food items with the package per family and each package had rice(30 kg. ), soyabean(2kg. ), oil(1.5 liters), as well as puffed rice, noodles and many more as we know that place is not suitable for agriculture which makes them getting crops just enough for 6 months in a year. So in order to fulfill this, SVSI distributed to all the people including chepang. Also the mother groups from sauraha and the medias like Kantipur and Naya patrika had the participation in this program. Likewise, the participation of a singer RAMESH RAJ BHATTARAI made the program more interesting. Also a team from SAPANA VILLAGE is there in SIDDI today to continue the help to villages ward # 6,7,8 and 9. In this way, the relief program was regarded as the significant help for the welfare of the people in those quake ravaged villages.